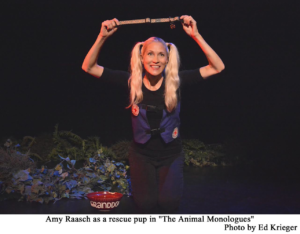 Part of a women’s ensemble The Solo Queens Fest, Amy Raasch squeezes in her love, more like an obsession, for animals. All animals not just cute home pets. She begins in a white lab coat wearing black framed glasses, to add to an intellectual gaze, then asks “Can you feel it? The animal inside all of the power none of the mess?” She slowly changes into a long back fur coat with white trim and a bear mask with a patch over the left eye. She uses a monitor to provide outdoor shots as she roams the woods. She takes on many animal skins while voicing their need for help from humans. A boyfriend once gave her a tiger kitten and she acts that out. She portrayed a beaver on suicidal watch because of a Disney film she saw where beavers were thrown away like rubbish. She’s a seductive fox a kitty with ears and claws who befriends and is later adopted by a bodega owner. 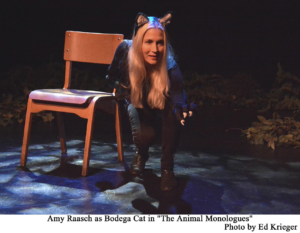 She incorporates her short film “Cat Bird Coyote,” which won the Los Angeles Independent and Big Apple International Film Festival. She fondly recalls how a dog helped in 9/11 finding bodies by its keen sense of smell at ground zero. Raasch takes on the personalities of eight distinctive animals while subtly morphing back into a human being. As a scientist, she digs deep into the animals psyche. This inside look provides us as humans a small window of how animals survive but still have an instinctual need to thrive with the help of human beings. Her passion, or obsession, is infectious. It’s damn hard not to have compassion for the furry creatures who are helpless in the streets. You need to have a stream of icy water coursing through your veins to not feel compassion for animals who are left to die in the streets. Raasch brings forth much needed awareness for people who don’t know what is going on. Which is, animals have a heart, have feelings and need the care of a healing touch in order to survive. Raasch eloquently speaks about the animals with passion and concern and some obsession, but it’s all good. Once in a awhile we need someone to proclaim that concern and reach our empathy core to actually do something. She’s that voice and people should and will listen.